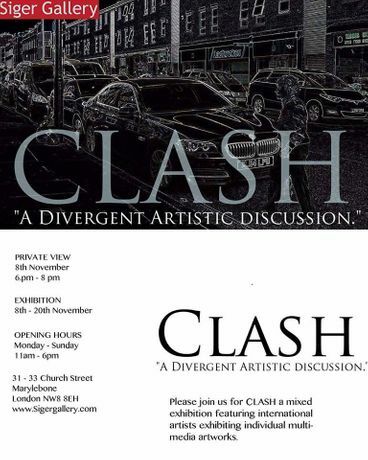 Save Event: CLASH “Divergent Artistic discussions." Share CLASH “Divergent Artistic discussions." A mixed show of international artists exhibiting individual multimedia artworks. Jon Baker, Seruni Bodjawati, Armelle Burke, Tom Burr, Graham Carrick, Tom Estes, William Esdale, India Roper Evens, Linda Lieberman, Francesca Lolli, Rahman Hak Hagir, Zil Hoque, Mutalib Man, Ar Mechan, Jude Cowan Montigue, Alex Allmont, Guillermo Monroy, Martin Pickles, Frederico Penteado, Jim Racine, Aerial Sparks, Andy Stewart, Susana Sauroman, Sylvia Toy St Louis, Lucieta Williams, Desdemona Veron, Blair Zaye. “Artists are not defined by their average but by their extremes."